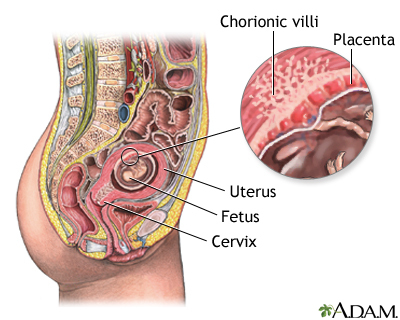 Chorionic villi are microscopic projections that line the chorion, the outermost layer of the embryonic sac. Surgeons sample these projections for genetic testing because they contain the same genetic material as a fetus. If you are at risk for delivering a baby with genetic abnormalities, your health-care provider may recommend this prenatal test, which is performed at 10 to 12 weeks gestation to find out a fetus' genetic makeup.